The routine use of estimating equations for GFR has revolutionized the way that we view renal disease over the last 15 years and although some argue that this has lead to overdiagnosis of CKD, I believe that this has been an extremely positive development both in clinical and research terms. One criticism of the MDRD equation in particular was that it did not perform well in patients with near normal GFR and the CKD-Epi equation was introduced, at least in part, because of this limitation. However, there remain concerns that in patients with diabetes, particularly in those with hyperfiltration, this formula still does not perform sufficiently well. To answer this question researchers in Italy took patients from two clinical trials who had serial measured GFR for up to 8 years and compared the results with simultaneous estimates of GFR using the 14 different equations. 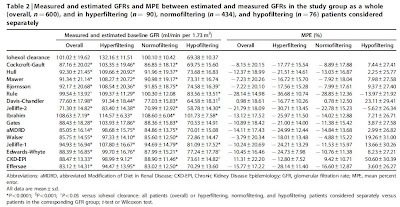 Of the 600 patients included, 15% were hyperfiltering and 13% had a reduced GFR. Overall, all but one of the equations underestimated GFR in the group as a whole. The single equation that overestimated GFR (Ibrahim) tended to overestimate at all levels. The range of differences between the mGFR and eGFR was -40 to +20 ml/min/1.73m2 and the mean percent error (MPE) ranged from -28.14 to 0.98%. 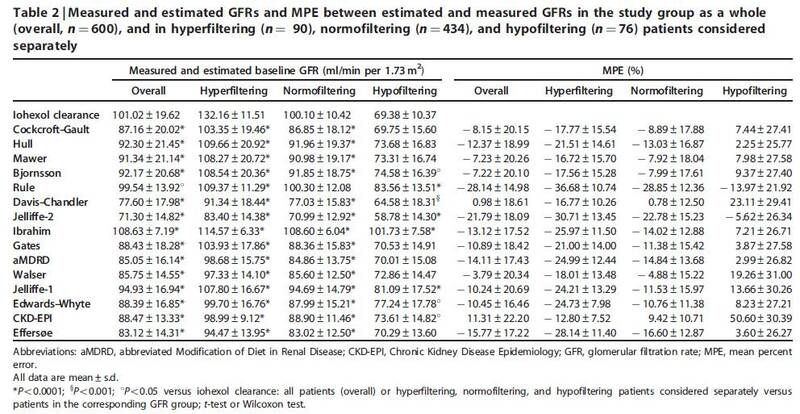 Not unexpectedly, the majority of the error was related to underestimation of GFR in patients with hyperfilatration (MPE -12.8 to -36.7%). It is notable that the MPE was lowest in participants with hyperfiltration using the CKD-Epi equation. In this group, the mean mGFR was 132 ml/min/1.73m2 while the mean eGFR ranged from 83-114 ml/min/1.73m2. 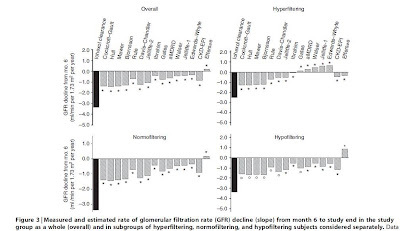 The bias was far lower for the normofiltration and low GFR groups. Because the authors had longitudinal data also, they were able to look at the ability of the formulas to measure GFR decline over time. 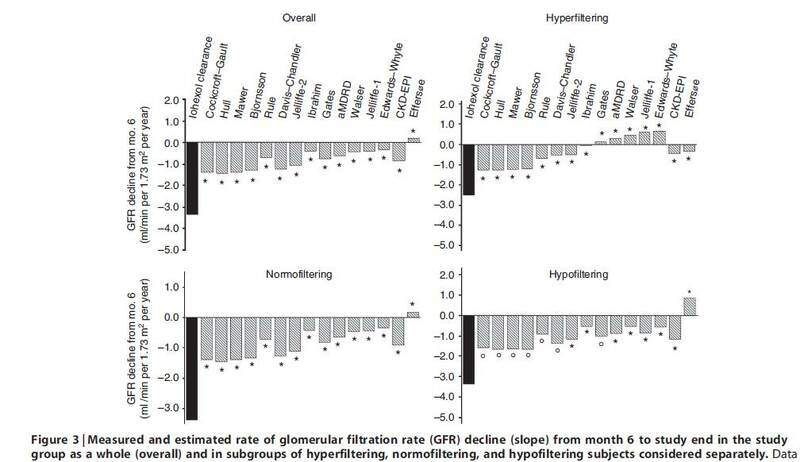 Given that all of the equations underestimated GFR at baseline, it is unsurprising that there was systematic underestimation of GFR decline over time, particularly in the patients with hyperfiltration. This was less marked in the patients with CKD at baseline. Five of the equations actually estimated that GFR was increasing in the patients despite a consistent decline in mGFR. This is all not to say that these formulas are not useful. It is always important to recognize the limitations of your tools and one of the major issues here is that creatinine is used as the marker of kidney function with all of the limitations that this introduces. It should also be said that although the agreement with mGFR might not be great, we know from large EPI studies that an eGFR of less than 60 ml/min/1.73m2 is associated with poorer outcomes and this is true no matter what the cause of the disease. The take home from this is that it is not possible to accurately diagnose hyperfiltration in diabetic patients without over nephropathy using current creatinine-based estimating equations and that other signs should be taken into account when assessing these patients. Hyperoxaluria is an important risk factor for kidney stones, approximately 80% of which are primarily composed of calcium oxalate. Hyperoxaluria is typically diagnosed by performing a 24 hour urine collection and levels above 45 mg/day are considered abnormal although, depending on the other urine constituents, the risk of CaOx stones increases when the urinary oxalate level is above 20 mg/dl. It is important to distinguish between hyperoxaluria that results from increased oxalate production (endogenous) and increased oxalate ingestion (enteric). The classic disease associated with increased oxalate production is primary hyperoxaluria. There are 3 identified types although all result from defects in glycoxylate metabolism leading to oxalate accumulation. At first, the manifestations are primarily renal leading to nephrolithiasis and nephrocalcinosis. However, as the disease progresses, the serum oxalate concentration increases eventually resulting in extra-renal oxalate deposition. Vitamin C is metabolized to oxalate also so that patients with oxalate-containing kidney stones should probably avoid excess vitamin C supplementation as this could increase the risk of stones. In the setting of malabsorption syndromes and GI disease. This occurs in patients following bariatric surgery, fat malabsorption and inflammatory bowel disease. The mechanism is thought to be related to binding of calcium to fatty acids thus reducing the availability of calcium for oxalate-binding, along with increased large bowel permeability. There have been multiple cases of patients developing severe oxalosis following jejuno-ileal bypass surgery. The treatment of hyperoxaluria depends on the cause. For all patients, increasing fluid intake is good advice. Some patients with primary hyperoxaluria respond to treatment with pyridoxine which promotes conversion of glycoxylate to glycine instead of oxalate. Recently, a bacterium has been identified that metabolizes oxalate in the gut and this has been proposed as a potential treatment for hyperoxaluria. Interestingly, antibiotic treatment has been shown to decrease oxalobacter colonization in individuals with peptic ulcer disease. Of course, all patients with hyperoxaluria should be advised to reduce oxalate consumption in the diet. 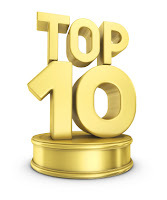 Foods high in oxalate include spinach, rhubarb, tea, chocolate, star fruit and soy products. A full list can be found here. Rhubarb is an interesting case. In the First World War because of the lack of access to fresh vegetables, the British government recommended that families supplement their diets with rhubarb leaves which were not traditionally eaten. It turns out that this was very bad advice. 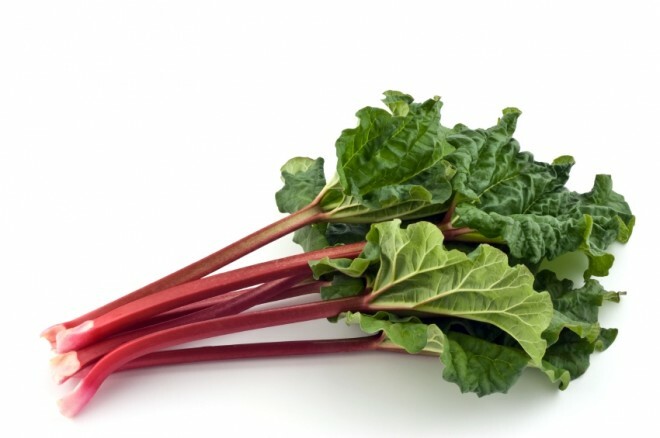 Rhubarb leaves contain considerably more oxalate than the stalks and there was a flurry of case reports towards the end of the war detailing cases of oxalate poisoning from rhubarb leaf consumption (see also and this). The toxicity of the leaves was probably increased by advice to cool the leaves with soda which increases the solubility of oxalate. Although the MD50 of oxalate would require the ingestion of about 5kg of rhubarb leaves, one could imagine that much lower doses would be toxic in patients with chronic kidney disease. One last point about oxalate. It is a terminal metabolite and was thought to not have any positive role. However, recent data have suggested that oxalate is important for chloride transport in the proximal tubule where it acts similarly to formate.. Plasma Exchange for Severe ANCA-Associated Vasculitis (AAV)? There has been lots of new data in the AAV literature of late. We have new nomenclature, including the dropping of Freidrich Wegeners name for the more generic but descriptive granulomatosis plus angiitis (GPA), by the Chapel Hill consensus conference. A large genome wide association study by the European Vasculitis Genetics Consortium has reported genetic variants associated with AAV and show that polymorphism segregate with ANCA specificity (Anti-MPO and Anti-PR3). A recent follow-up to the RAVE study demonstrates non-inferiority of rituximab as compared to oral cyclophosphamide for severe AAV. Moreover, among patients who had relapsing disease at baseline, rituximab was superior to conventional immunosuppression, at least for the first year. Removing pathogenic antibodies via plasma exchange (PE) is an attractive, if crude, treatment option for severe AAV and is generally recommended for severe alveolar hemorrhage (although without much evidence). In patients without severe lung involvement, it has gained a role in attempting to prevent ESRD in patients with severe renal disease at presentation, due largely to the MEPEX trial. MEPEX was published in 2007 and included patients with AAV who required dialysis at presentation or had a serum creatinine >500 µmol/L (5.8 mg/dL). This study included 137 patients who were randomized to 7 PE treatments or IV methlyprednsiolone pulse therapy. Both groups received oral steroids and cyclophosphamide. PE was associated with a risk reduction of ESRD of 24% at 1 year. Patient survival and severe adverse event rates were similar in the 2 groups. A follow up to MEPEX has been published in Kidney International this month where the original patients were followed for a median of 3.95 years. During this follow-up, over a half of patient died and almost two-thirds had either died or developed ESRD (the composite primary outcome), with no significant difference between the groups. Also, there was no significant differences in relapse rate. It must be noted that the original MEPEX trial was designed to examine rate of ESRD alone and demonstrated a benefit with PE at 1 year. The current study looks at a composite of ESRD & death at 4 years. If the early effect on ESRD is real, it would be intuitive that later mortality would be improved which it seems is not. Overall this study questions the benefit of PE in severe AAV and certainly dampens our enthusiasm for its use in this sick patient cohort. A criticism of MEPEX is that IV methlyprednisolone is considered a standard of care in initial treatment of severe AAV and not an alternative to PE. In the real world, patients would receive IV methylprednisolone plus PE. It is also very possible that a beneficial effect of PE exists in cases of AAV earlier in their natural history before significant scarring has occurred, as suggested by a meta-analysis. At this point, PE can certainly be considered as part of the armamentarium of AAV treatment but its exact indication is unclear. The ongoing PEXIVAS trial is planned to enroll 500 patients and will hopefully clarify the role of PE, if any, in severe AAV. In June's edition of JASN Jacques et al. highlighted the emerging importance of the role of chloride in the pathogenesis of hypertension. Their group developed a mouse model that over expressed the protein pendrin in the aldosterone-sensitive region of the distal tubule. These mice developed hypertension that was attributed to increased NaCl absorption driven by over expression and increased activity of the pendrin chloride exchanger. Pendrin was first described as a chloride channel in the kidney in the early 2000s. Pendrin is a chloride-bicarbonate exchange protein that facilitates the electroneutral movement of chloride to the intracellular space and bicarbonate to the extracellular space or urinary space. This channel is also found in the thyroid and inner ear and is the gene that causes Pendreds syndrom. 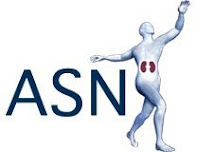 It is now widely accepted that the pressor effects of salt (NaCl) are dependent on Na as the major determinant of intravascular volume and thus hypertension. It has also been demonstrated that for Na to mediate a hypertensive effect, it needs to be in the form of NaCl (Berghoff and Geraci, Intern Med J 56:395-397). In their study, Berghoff and Geraci showed that subjects on a high NaCl diet but not on a high NaBicarbonate diet developed hypertension. These experiments have been reproduced in human and animal models. Interestingly, hypertensive and normotensive subjects switched from a NaCl diet to an equimolar NaBicarbonate diet experienced a decrease in blood pressure. Pendrin is normally found in the type B Intercalated cells of the aldosterone region of the nephron. Recently published studies by the same group suggest that pendrin can also work in tandem with the Na-dependent chloride/bicarbonate exchanger (this is a different channel to pendrin and is also found in the CCD) resulting in electroneutral NaCl absorption and that this process is thiazide sensitive. In JASNs June edition, the Jacques group showed that pendrin mediates chloride absorption distally and that this is the driving force for Na absorption distally either through the ENaC and/or Ndcbe channels. The significance of their findings are that 1) chloride is required for NaCl absorption in ‘salt sensitive’ hypertension and that 2) pendrin is the channel that facilitates the absorption of chloride. On the basis of this paper and other papers showing similar findings with regard to Pendrin's role in NaCl balance the authors suggest their work solidifies the concept of chloride-sensitive hypertension. It must be remembered that these studies don’t dispute that Na is primary in maintaining blood volume and driving hypertension. 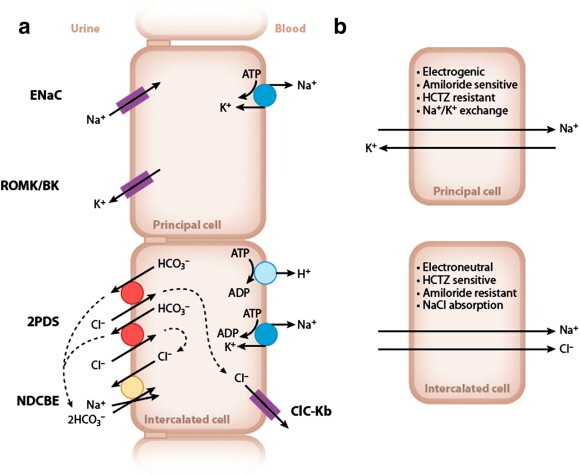 However, chloride absorption is a necessary requirement for the absorption of Na in the setting of a salt load causing hypertension. Thus, Chloride might be the queen and Na the king of extracellular solutes! See these previous posts on Pendrin function in the kidney. A 24 year-old ESRD patient secondary to IgA nephropathy has been on HD for almost one year. His mother is a potential donor for living related kidney transplant. The condition seemed perfect—zero mismatch on HLA, no PRA, no DSA—except for ABO-incompatibility. Type O in the recipient and type A in the donor. What are ABO antigens, and where are they expressed? 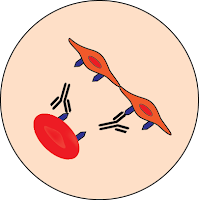 ABO antigens, discovered by Karl Landsteiner in 1901, are glycoprotein antigens, expressed not only on the surface of red blood cells, but also on endothelial cells, and epithelial cells. Why is ABO incompatibility a relative contraindication to transplantation? As noted above, ABO antigens are expressed on the donor kidney, and can be a target of antibody-mediated rejection. The first ABO-incompatible kidney transplant (ABOi KT) was performed in mid 1950s and ended up with hyperacute rejection (HAR). Therefore, this procedure was considered as a contraindication until recently. The concept of depleting anti-AB Abs was introduced in early 1980s, leading to successful ABOi KT by Alexandre et al., followed by great effort in Japan to improve outcomes, where ABOi KT now consists of 30% of living donor KT. Nowadays, ABOi KT is becoming a reasonable option in the US as well. What is the usual immunosuppressive protocol to transplant these patients? Are ABO antibody titers important for determining the feasibility of transplant? Unfortunately, there are no randomized controlled trials for the pre-transplant conditioning regimens for ABOi KT. However, the basic idea of overcoming ABO-incompatibility is decreasing the circulating ABO antibodies via combination of (1) antibody depletion (e.g. plasmaphresis) (2) IVIG, (3) Rituximab or splenectomy. Pre-transplant ABO antibody titers should be taken into consideration, which generally should be 1:16 or lower, although the number is exclusively based on empirical evidence. Interestingly, there may be no correlation with baseline antibody titers and graft survivals. For maintenance immunosuppressive regimen, therapy, there is no need for higher intensity of immunosuppression compared to ABO compatible KT. Initially, HAR was the largest concern for ABOi KT, but is not major concern with the use of current desensitization protocols . Antibody-mediated hemolysis and delayed antibody-mediated rejection are potential complications. Therefore, post-transplant monitoring of AB antibody titers is usually recommended. Of note, however, in the setting of ABOi KT, peritubular capillary C4d deposition alone is not diagnostic as this can be observed even in 80% of fully functioning grafts, called “accommodation”, the mechanism of which is not fully understood. How good are the long-term outcomes of transplants crossing an ABO barrier? Reports showed long-term graft survival of ABO-incompatible renal transplants are the same as those of ABO-matched transplants. One report from Japan showed that the overall patient survival rate was 97% for the first year and 95%, 93% and 90% for 3, 5 and 9 years after surgery, respectively. The 1-year graft survival rate was 93%, and that for 3, 5 and 9 years was 89%, 84%, and 72%, respectively. Of note, Montgomery et al. reported no difference in long-term patient survival but suggested more graft loss in the first 14 days after transplantation. Going back to our case, the patient went through plasmapheresis and two doses of rituximab injections (150 mg/m2, on POD #-14 and -1) as a pre-conditioning regimen. This was followed by a successful ABOi KT using Basiliximab as induction therapy, FK/MMF/Prednisone as maintenance regimen with excellent graft function months after transplant. An article from a few years ago that might provoke some discussion. Some of the recommendations are a little out of date (I don't think I would target a Hb of 12 anymore in patients with CKD) but overall it seems like good advice. A "normal" serum creatinine level may not be normal. Know the medications that spuriously raise the serum creatinine. Patients with decreased GFR or proteinuria should be evaluated to determine the cause; positive urine dipstick results for protein should be followed up with a spot urine protein/creatinine ratio. In patients with early-stage CKD, periodic evaluation and intervention are appropriate to slow the progression of renal disease and avoid complications. Do not automatically discontinue an ACEi or ARB solely because of a small increase in serum creatinine or potassium. Anemia in patients with CKD should be treated with ESAs but should not be over-treated. I don't see much to disagree with on this list - I might not put the knowledge that bactrim and cimetidine increase creatinine so high on the list. 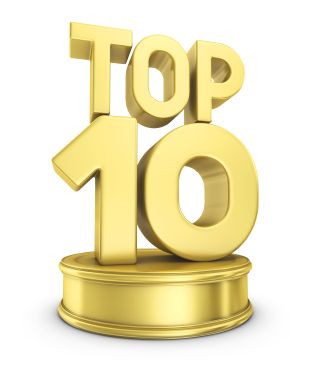 I particularly like number 10 - most patients with recurrent stone disease are unaware that more than 95% of stone recurrences can be prevented with proper medical therapy. With regard to number 8, although we don't really use aluminum-containing phosphate binders any more, it is still contained in some over-the-counter antacids. 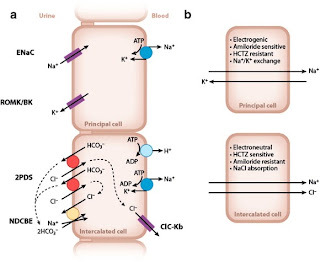 Citrate markedly increases the absorption of aluminum from the bowel and in patients with CKD, this has been associated with severe toxicity and death in one case series. Are there any other things that we should add to this list? This was an interesting case. A woman with a previous history of hyperparathyroidism and multiple neck surgeries who developed severe, symptomatic hypocalcemia 3 hours following a parathyroidectomy was thought to have failed because of a persistently elevated PTH level. This suggests that did in fact successfully remove her parathyroid gland and that there was an issue with the assay. In the hospital referred to in this case, the assay used was a Roche Elecsys PTH STAT assay. This is an antibody-based assay that uses two murine antibodies - a "capture" antibody and a "signal" antibody. In patients who have been previously exposed to murine tissue, anti-mouse antibodies can be present in the serum that bind to both of these antibodies giving a false positive result on the assay. In this case, the patient had received OKT3 in the past which has been associated with a prevalence of anti-mouse antibodies of up to 26%. Her PTH level was repeated using an alternative assay - her pre-op PTH was 18 pg/ml and her post-op PTH was 5 pg/ml. Unfortunately, she required long-term treatment with vitamin D and calcium supplementation. In retrospect, the normal calcium and phosphate in a patient with this degree of apparent hyperparathyroidism and normal kidney function was a clue that there may have been an issue with the test although, of course, it is easy to say that knowing the answer. Congratulations to "anonymous" for getting the correct answer. The complete case report can be found here. 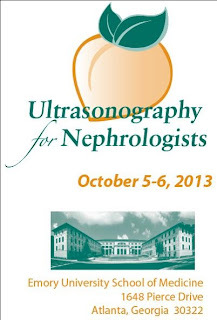 Continuing our practice of highlighting excellent courses for Nephrologists and Fellows, here is a message from Professor W. Charles O'Neill regarding the annual Ultrasound for Nephrologists Course at Emory University this October. The course brochure and application form are here. "Ultrasonography is an invaluable tool in nephrology and, following the lead of other specialists, nephrologists are beginning to incorporate ultrasound into their practice. It is convenient, economically feasible and improves patient care. Since this skill is not generally taught in training programs, we have been offering the Ultrasonography for Nephrologists course. The course has been very well received and has been given continuously since 1997. It is a comprehensive, weekend program that provides both didactic and hands-on training in ultrasonography of native and transplanted kidneys, end-stage kidneys and allografts, and guidance for biopsy and central venous catheterization. 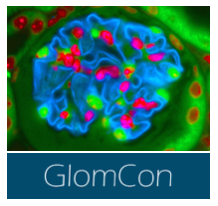 There are 6 hours of hands-on training that include patients with a variety of abnormalities. Also covered are financial aspects including equipment costs, billing, reimbursement, and other aspects such as reports, record-keeping, databases, quality assurance, and accreditation. There will also be an opportunity to use equipment from a variety of manufacturers. 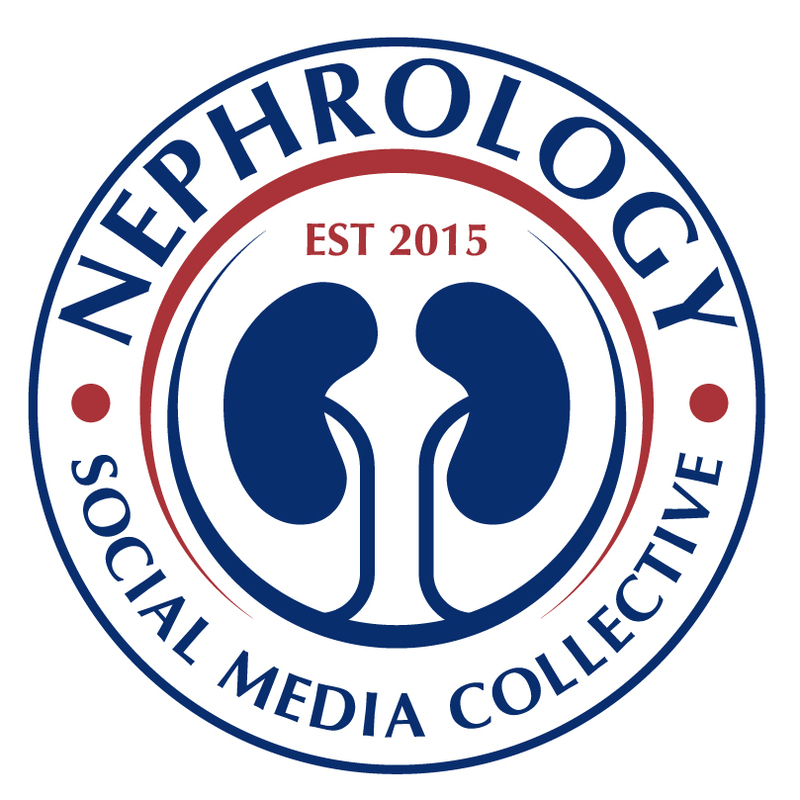 Pretty much everything a nephrologist needs to get started." Hypocalcemia - What's the Diagnosis? A 36yr old woman with a history of PCKD was referred for surgical treatment of hyperparathyroidism. She had a history of two prior failed kidney transplants following which she had been on dialysis for more than 10 years. She had a third renal transplant 10 years prior to this presentation which was still functional. At the time of her transplant, she had received OKT3 and was currently maintained on tacrolimus and prednisone. 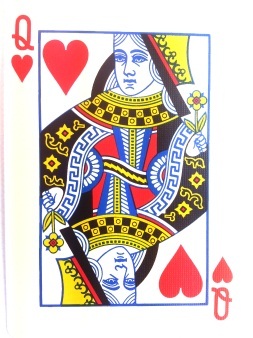 She had a long history of hyperparathyroidism. Six years prior to her transplant, she had a subtotal (3.5 glands) parathyroidectomy. The year of her transplant, she had another neck exploration with the removal of 8 nests of hypercellular parathyroid tissue. At the time of this presentation, her PTH was 3,300 pg/ml despite treatment with cinacalcet. Her ionized calcium was normal (1.2 mmol/L) but she complained of poor concentration, fatigue and depression. Serum phosphorous and creatinine were normal. She had a normal sestamibi scan but an US revealed hyperplastic parathyroid tissue in her neck. During the parathyroidectomy, frozen section revealed hypercellular parathyroid tissue that was removed. However, pre-op, intra-op and post-op PTH levels were elevated at >1700 pg/ml. Because of the persistently elevated PTH, it was considered a failed operation and calcium supplementation was not started post-op. However, within 3 hours of the operation, she developed perioral numbness, tetany and muscle spasms in her legs. Her ionized calcium was low (0.9 mmol/L) and her symptoms resolved after treatment with iv calcium. Her PTH remained elevated at 3000 pg/ml. What is the reason for her acute hypocalcemia in this setting? Answer in the comments please.